I spend one minute per day cleaning my "coop". No Kidding! I really do!! As I cleaned, she cooed words of kind encouragement and gratitude. I told her that I wanted to get a better picture of her. I asked her to give me her prettiest smile and I'd put her on my blog. I walked around and opened the egg box for a better shot. She didn't disappoint. . .See? My run on the other hand is another story. In spring, summer and fall, my girls free range all day and rarely go in the run except to get a drink or to go in the coop to lay an egg. In winter, they still free range, but rely on their "organic" commercial feed more. Cleaning the run is a weekly chore which takes me all of 5 minutes. When I have the kids do it, it takes "me" no time ;-). We use the stall rake and easily sift the poop out. With weekly cleanings of their run, they are in very clean and happy condition's. You'll notice how all of my roosting boards are 2x4 with the wide side up. I live in Michigan, and this allows them to sprawl their toes out when they roost and when they settle down on their feet, their bodies are able to completely warm their feet protecting them from frostbite. See how happy my girls are? You'll notice that Daisy and Dixie have chosen the months of JANUARY and FEBRUARY to begin their first molt. Seriously? The middle of winter?! Silly hens. I want you to notice their combs. We are well into our first winter, and not a patch of black from frostbite. Wanna know what I did to prevent frostbite? The culprit of frostbite in chickens is not cold. The culprit of frostbite, is humidity. If your coop is well ventilated (and cleaned), the humidity level is very low and thus the risk for frostbite is gone. Those who use the deep litter method create a very moist environment thus increasing the incidents of frostbite. I rarely use a heat lamp (Buff Orpington's are super winter hardy), but lately since my 2 silly girls are molting, I have added the extra heat for them. You'll also notice that I don't have food or water in the coop. I keep that in the run so they are are encouraged to spend their winter days outside. My girls LOVE to be outside. They only go in the coop to lay an egg and to go to sleep. Sometimes, they don't even go in to sleep! I'll come outside to close the pop door only to find them sleeping on the roosts in the run! I of course carry each sleepy girl into the coop on those occasions. So all told, it takes me a total of 7 minutes per week to clean my coop each and every day, and only 5 minutes per week for the run. It's gotta beat the job it must be to clean a coop once or twice a year!! My girls are worth it though. I don't add any artificial light to the coop (aside from their red heat lamp on really cold nights, and during this molt), and my girls have been faithfully giving me 2 eggs per day. Today, I got 3 eggs for the first time! I am so excited. My happy hens don't care that it is cold out with shorter days. My girls are doing a great job laying. I can't wait for spring. We are going to get 2 more Buff Orpington babies. It's my hope that I'll have a broody hen at the time we pick the babies up. Tara, Madeline and I would love to see one of our Henny Penny's be a mama. I could just slip the newly hatched babies under her, for her to raise. If not, we'll hand raise them, but we are really hoping that we will have perfect broody timing. 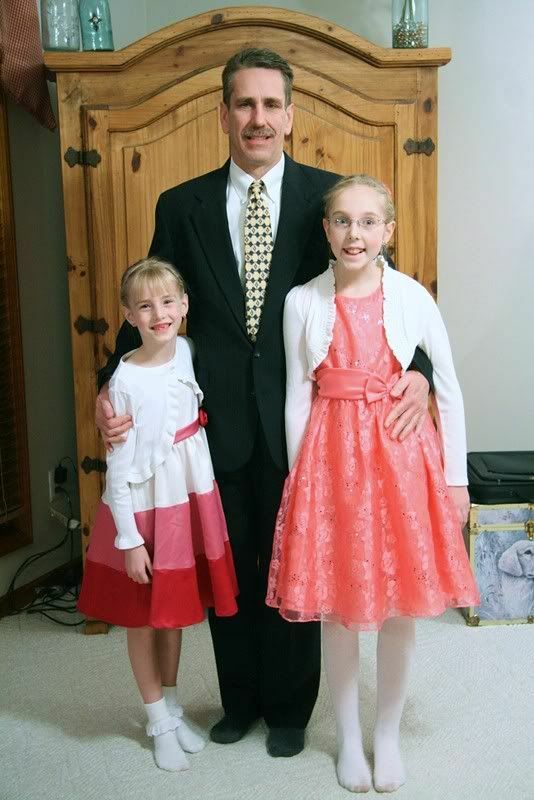 On a little side note, I'm home alone while daddy and girls are at the Daddy Daughter Dance. Their hair is so pretty. It was a rush getting them ready, knocking out homework, eating dinner and snapping a FEW photos. This is the best I got of the hair. I know it's been a long time since I've posted, but I've had a rough winter. I had a staph infection in my throat which turned into walking pneumonia which developed into kidney issues and then finally I had surgery. I'm still recovering from the surgery but hope to be feeling better in a couple more weeks. Prayers for pain relief would be greatly appreciated! I love your coop setup! We currently have a walk in run and two Eglu Go houses but are building a larger wooden coop in the next month or so. I will definitely use some of your ideas. I agree about sand, our run is sand, it's SO much easier to keep clean. It sure is Alexis. I love that it completely keeps the odor away (when kept clean). But with sand, cleaning is so simple which means easier access to chicken poop fertilizer. :) I can't wait to see your new coop! One thing I love about my coop is that everything is raised up so I don't have to stoop to clean. It is really a great feature to think about when designing your own. 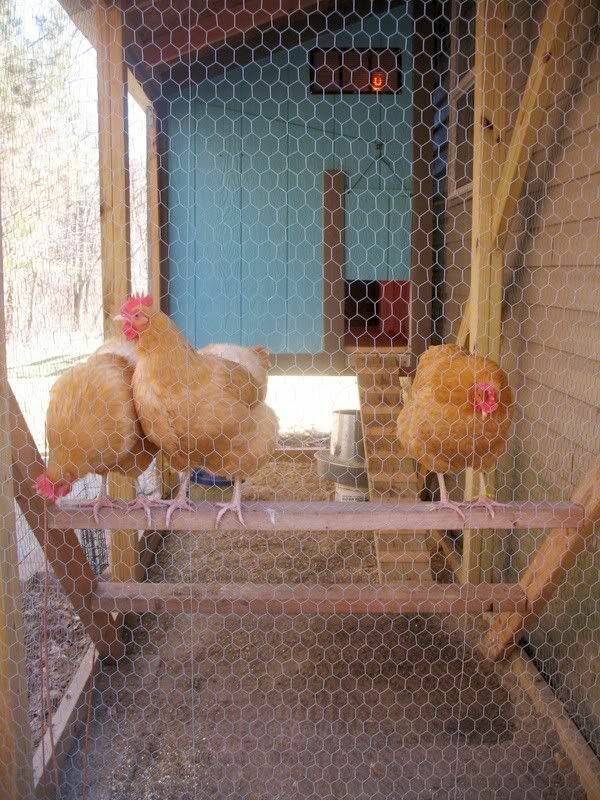 Having the coop up off the ground is also great because it protects the hens from dampness. I'm so glad you found me as well. Welcome to the world of chicken keeping!! It's such an amazing and rewarding adventure. You will have lots of fun and the sand will keep things smelling so clean! Please come back and visit us often!! Kelly-great update and photos. Can't believe how big the girls are...ALL of them! Keep up the great blog. Thanks Denise. Yes, Tara and Madeline have gotten sooooo big. I can't believe how tall Tara looks next to Ron! It's going by way too fast. Just like your grand kids. Although Cara's kids are such little peanuts, they never seem to grow!! LOVE this. I switched to sand about a year ago and never looked back. I do what you do and give the house and run a quick cleaning each day. I spend a bit more time on the weekends because I turn the compost bin and scrub out the waterers and refill. But it really is super easy. You're welcome Lauren. And the girlies had a great time with daddy!! By the way, I never was able to spot Marky in that Superbowl Sunday photo!! First time I couldn't find him, and it's driving me crazy! Great photos and a wonderful blog about your life with chickens! Thank you Helen. It's so nice to hear that. I hope you come back and visit us again! Love all your pics of your chickies and your human girls! Everything is always so clean and pretty! Hope you are feeling better soon! Thank you so much Flock Mama. I am starting to feel better! It's so fun sharing the chicken experience. I'm happy that it brings smiles to more that just my face. Glad I could help in changing your mind Meredith!! I just love sand and I know that everyone else would too, if they only knew about!! I really don't have a separate run and coop for my girls. Everything is in one large flight cage. How would switching to sand work? I feed lots of veggies which I just throw on the ground (currently using alfalfa and hay) is it okay for them to eat the sand? 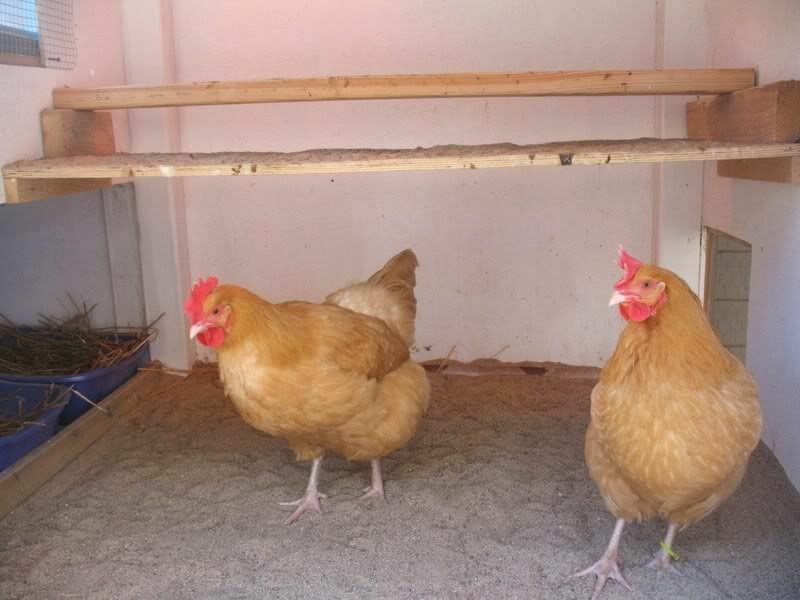 The benefits of sand are that it is so easy to keep the surfaces that chickens live on very clean. Poop is easy to see, dries quickly in the sand, and can easily be cleaned up on a more regular basis with very little effort. Their space is odor free, which completely eliminates flies and it's just an overall healthier place to live. Sand also acts as a natural grit for chickens. It's perfectly fine for them to eat it. I too give them left over greens. Although I feed it to my girls (since there are only 3 of them) in a bowl, they have terrible table manners and it usually gets tossed all over the ground. They eat it all up though! In any place that chickens live, no matter the set up, sand is a great surface for them. It's far more "human friendly" than anything else. Good luck! Loving your blog! I've just converted a shed for my girls and after reading this, I'm sold on putting sand in there for the floor. I have a question though, is it just builders sand/sharp sand you use? I replied to you on FB Sam. But I'm really glad you're going to make the switch. You'll love it. In answer to your question though, sharp sand is best (river/construction/concrete sand will all work well). Thank you Mandles. 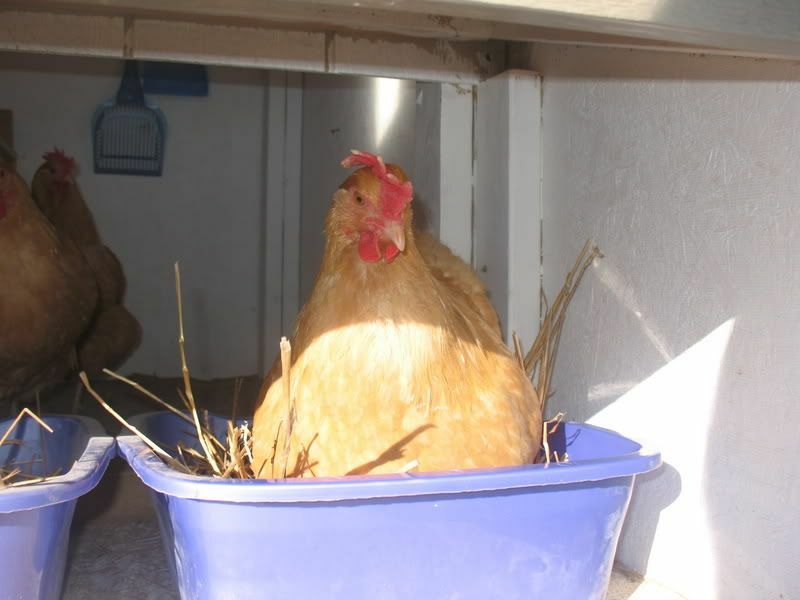 My coop is a combination of all the best ideas that I found on Backyard Chickens website. I just put everyone else's great ideas into one spot. My coop! The only fault in my set up is the chicken wire. I wish my husband had used hardware cloth. Other than that, I wouldn't change a thing! 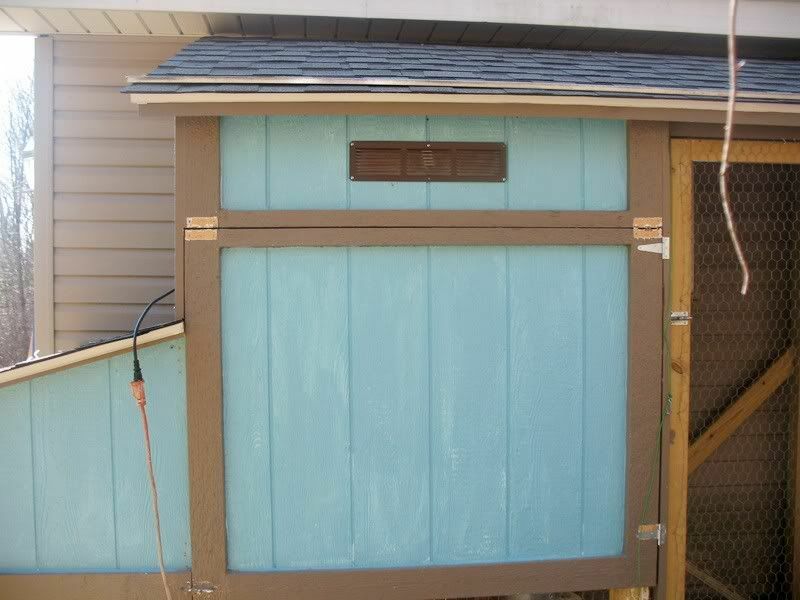 Thanks for posting on BYC about your coop, very cute and is giving me lots of ideas!! I can't wait to get started. No problem! Whenever someone is starting from the ground up, is the best time to get good applicable ideas. It drains very well. Sand is not as "dirty" as mud. When you walk on it wet, it's nothing like mud sticking all over your shoes. Same applies for the chicken's feet. Keeps them all around "cleaner". Especially when you keep the poop out of it. I have found that the sand dries pretty quickly. They also love to dust bathe in it. Hi Kelly, do you have "plans" (how to build) for your coop? I've been looking all over the internet for what coop I want to build and I love yours the best! But my hubby and I are not construction minded at all. lol -Jen. My hubby kind of just did it out of his head, but I can see if he'll draw up some plans for you. Can you give me an email address that I can reach you at? 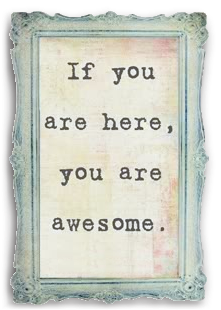 Thank you for your wonderful blog spot. You are starting to convince me to go with sand. I have a similar setup and number of BO girls (hopefully! They are 2 weeks old) and was already planning for sand in the run, but was thinking of doing deep litter in the coop. I was going to do this for cleanliness, warmth, easy of cleaning... However I may go with sand. I plan to spend every day with the girls but will travel some and be gone for a few days in a row. I have a sitter, but she won't be able to clean the coop daily. Will the sand become a mess without daily cleaning? Also do you ever have to completely chance out the sand or add to it? Our weather ishot and dry in the summer and cold and snowy in the winter, low humidity. My weather is the same as yours. Sand works very well in both cold and also hot temps. In my coop, I have not had to change out the sand at all, but I have added to it when needed. Since last summer, I have added 2 50lb. bags at different times. I'll be a while before I need to add any more though. I have not removed any sand in the run "yet" but I'm sure the day will come eventually. It's a lot cheaper and cleaner than dirt, shavings, wood chips or hay. As far as going several days without cleaning the coop, I have done that on occasion (after my surgery), and it wasn't bad. It didn't get too nasty and was really quick to clean up. My favorite 2 things about sand are ease of cleaning, and pleasant smelling environment for humans and chickens. By the way. . .I am feeling very healthy now! Thank you for your concern. You're welcome Sandy! I love hearing how other's use sand as well. The more we talk about it, the more others can become aware. Sand is just such a clean dry environment for all of our chickens. If only everyone knew. The stall rake is great. I use it when the hens get naughty and spread hay inside the coop. It's also really nice for the run. Thank you for all of the ideas! I basically copied you earlier this year - it turned out great! It looks beautiful!! You did a great job! It's so nice that you also made your run tall enough for us human folk to stand comfortably inside. It makes cleaning so much easier! Your little pullets in the photo were so beautiful!! Thank you so much for sharing your coop. We have chicks that are 3 weeks old and are about to make our first chicken coop! What kind of sand do you use and where do you get it? I love your design! How much is the sand? Ruqaiya-The sand is approximately $3.00 per 50lb. bag. Not too terribly expensive! Okay thank you so much! You have been a great help to me! And I love you chickens!!!! They look SOOOOO healthy and beautiful!!!! And your kids are just the cutest little girls!!!!! How did you hook up a heat lamp into your coop? Without the big hassle of a bunch of wires!!!!! I would really love to keep them warm if they get cold outside!!!!! I just screwed a hook into one of the inside roof boards. The heat lamp easily hung from it. My husband cut a hole in the side of the coop so I could fish the cord out, and plug it into an extension cord. It's really nice to have on the really cold days. I was trying to decide of what to put in there and I ran across your blog. I think i'm going to go to Home Depot tomorrow and buy a couple bags of sand. :) Do you think it will dry quickly the parts the duck gets wet? Also, I'm new to this... In the coop, I don't have anything in it as well and I am thinking just some straw or hay to help keep them warm in the winter. I live in Montana so it gets very cold in the winter. I am scared to put a heat lamp in the coop because of "fire"
What do you think will help keep them warmer? hay or straw or what? I'm sorry it's taken so long to get back with you. I have been without a computer since the 9th, and just got it back today! I'm sure you found out the answer of the duck and water in the run. It will dry quicker than dirt, and will be less "dirty" than dirt, but depending on the weather, when you have a duck and water in the run, chances it's going to stay wet and messy. As far as comfort in the winter, I use sand and honestly chickens are more comfortable in cold weather than they are in hot because of their feathers. You could use hay, but that would be far messier than sand. There are precautions you can take with a heat lamp. For instance, you can place the lamp behind a shield of hardware cloth for added protection. I didn't have any problems when my girls were molting and needed the extra heat. I'm sure hay would be warmer than sand though. Enjoy your girls and I'm sorry for the delay in responding. Well, when it comes to raising chickens, I say better later than never. You are going to just love the world of SAND!! I'm so glad you found me. I do have to say though, it's been about a year and 1/2 since I've had sand in my run and my hubby and I are going to be scooping the "existing" sand out of the run and replacing it with fresh for winter. It will go to the compost pile. The chicken coop is still looking as beautiful as ever. Enjoy your new brood and have a blessed day!! The poop board is under the roosting pole. Congratulations on your new chickens! I hope my coop set up was helpful. Enjoy your chickens!!! 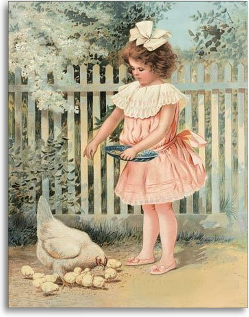 Hello Kelly, ive sent you a friend request on Facebook..I am new to chickens and you seem like someone i could learn a lot from :) hope to hear from you soon! Sand harbors e. coli and it doesn't act as 'grit' as it is too small and can cause impacted crops. Not only that the poop will get 'breaded in the sand and then the chickens will be apt to eat it. I JUST read about this on another blog warning against using sand. It has no insulation properties and is not recommended by chickens experts to be used in a coop. The run area isn't as bad, but please do some research into using sand in your coop. Just because it's easier for you doesn't mean its best for your chickens. Sounds like the lazy man's way out. I take it you have absolutely no experience with sand. I have been using it for 2 years, and I can tell you that it does not harbor e. coli. And the reason why, is because the poop is removed from the coop on a "daily" basis (that's just basic common sense). Pine shavings on the other hand do in fact harbor e. coli and parasites because they are changed minimally, (especially those who use deep litter method). 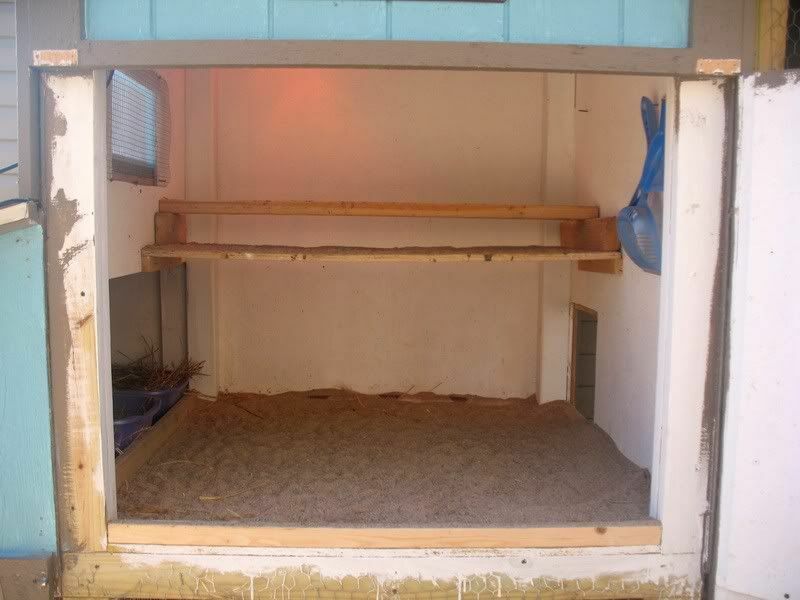 It is much easier to tend to a coop with sand, but it is also MUCH more sanitary than straw or shavings. 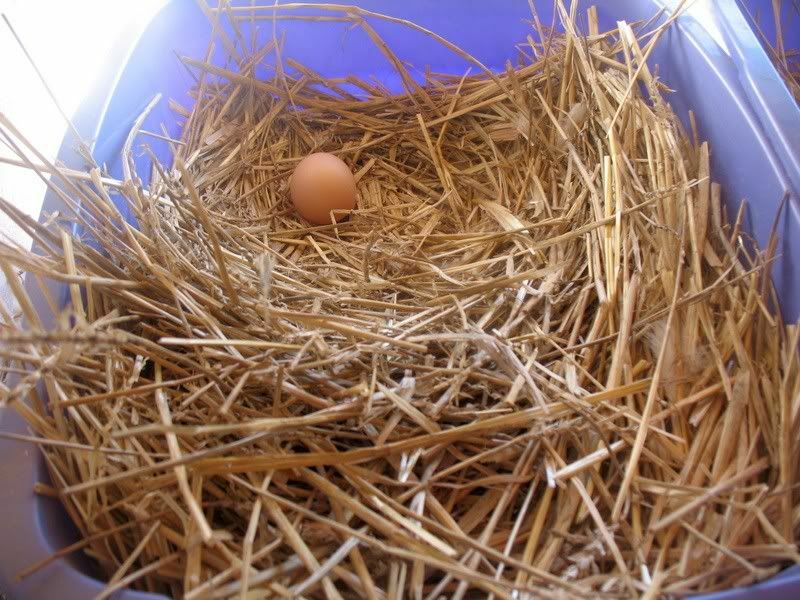 It is a drier environment (which is crucial for the health of a chicken), and less habitable to fleas and ticks. I live in the Northeast U.S. and we get very cold weather up here during the winter months. Our chickens sleep on their roosts and not in the sand. Their feathers keep them quite warm and they even free range in the snow. You claim that "chicken experts" warn against sand? I'd love to see a study where your "chicken experts" claim that. I choose to keep my chickens in extremely clean, feces free conditions on a daily basis and you accuse me of using sand because it's the "lazy man's way out"? The truth of the matter is that I love my hens so much that I want them to have the best, cleanest, disease free conditions possible and I have done just that. You have every right to have a differing opinion, but I am speaking from "experience". 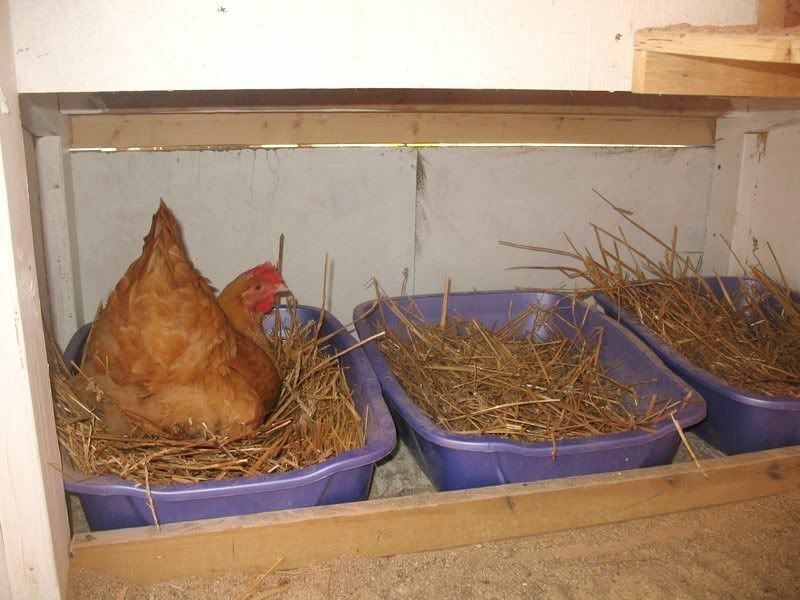 You can use whatever you want in your coop, but I will continue to encourage the use of sand as it is used and proven to be healthy, dry, and bacteria free at my house. A little common sense is all one needs when looking at the alternative. Moist, poop filled shavings/straw--or dry, odor and and ammonia free sand (which is cleaned on a daily basis). Yep...sticking with the obvious and spreading the news of it. Oh...and who said anything about sand acting as grit? Did you even read my post? I'm not trying to stir things up but I just read thru all the comments today for the first time as I am about to inherit 5 hens within the month and I have lots to do to get ready. Personally I like the idea of the sand for all your reasons. I'll give it a go ! Thanks for sharing all your hard work and ideas ! Absolutely fabulous post. I do not use sand in my run as I live in a rural area and my run is quite large but I will be using in my coop! I think your post is very educational and quite intertaining! Thank you Jean. You are going to love it in your coop. The chickens will appreciate it too!! I'm glad it helped!! Hello, I called Home Depot today and they told me they have 50 pound bags of general all purpose sand for $3.99 I believe. They also were unable to tell me whether or not it's silica free? I was just wondering if this is the correct sand to use? Thank you in advance for your help! I use THIS type of sand, and it works very well. I'm so happy I found your blog; it is wonderful. My family and I are originally from Michigan but moved to beautiful, but very wet, Portland, Oregon last summer. Our 9 year old daughter finally convinced us, after 3 years of campaigning, to get chickens and we have 5 chicks that are almost 7 weeks old. 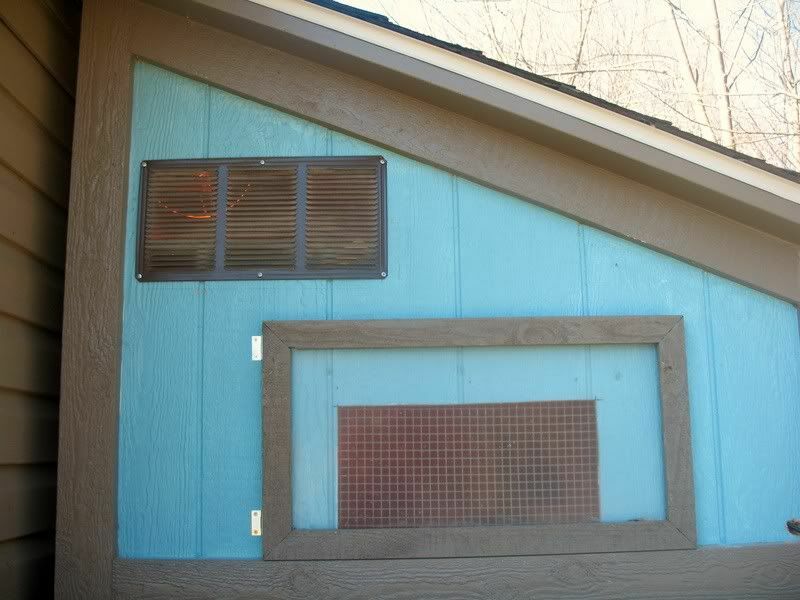 We have a chicken coop/run similar to yours with an elevated coop and covered run. I've been going back and forth about what type of litter to use. They love scratching around in straw and pine chips (on their day trips out to the run), but it gets so wet in their run I'm not sure that it is a good long term option. I'm really considering sand but am concerned that it will get yucky/stinky when wet (rain does tend to come in at the sides when it rains hard). Do you find smell a problem at all? Also, do you have any problems with the weight of the sand in the coop? I've read that it may be too heavy for an elevated coop. Last question I promise! Do your chickens scratch around in the sand? Mine enjoy scratching and digging so much that I'm concerned they may get bored with sand. Wow, sorry this comment is so long. Hopefully you can help me finally make up my mind about sand vs. pine shavings! I have one week before the chicks go out to their big girl house! I'm just going to jump right in and answer your questions. Because we keep our coop and our run perfectly clean at all times, there is no smell what so ever. Not when it's hot and humid, and not when it's wet and rainy. It's the poop that smells and unlike shavings, dirt, straw or hay, sand is VERY easy to maintain and keep clean thus is odor free. Sand on the floor of a raised coop is not a problem at all. You won't have to worry about the weight of it. I have about an inch and 1/2 on the floor of my coop. No structural problems at all. I'm sure that the only time it would pose a problem with a raised coop is if the raised coop was not soundly constructed. You thought that they may get bored scratching in the sand: It is a chickens instinct to "scratch and peck". They will do it in dirt, straw, shavings and sand. My chickens free range from dawn till dusk, so they really don't spend very much time in their run. 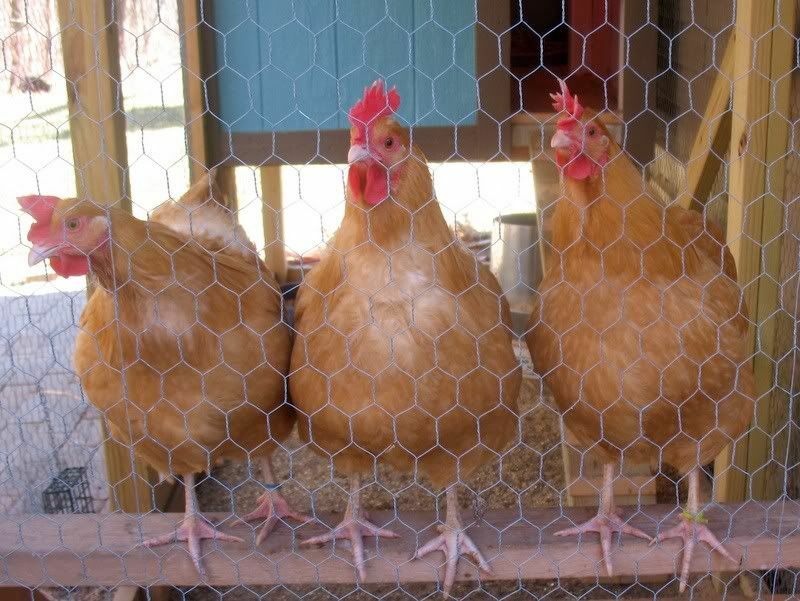 When you have a feces free environment, it is the healthiest place for chickens to scratch and peck and sand offers the best opportunity to keep your coop and run poop free! Now another nice benefit to well cleaned sand in the run is this: Dirt, straw, and shavings will all make a poopy mess which will stick to your shoes while tending to the girls. Sand, even when wet, will not stick to your shoes. It also keeps the feet of your chickens clean and healthy. I can not say enough about how sand is the "only" way to go. 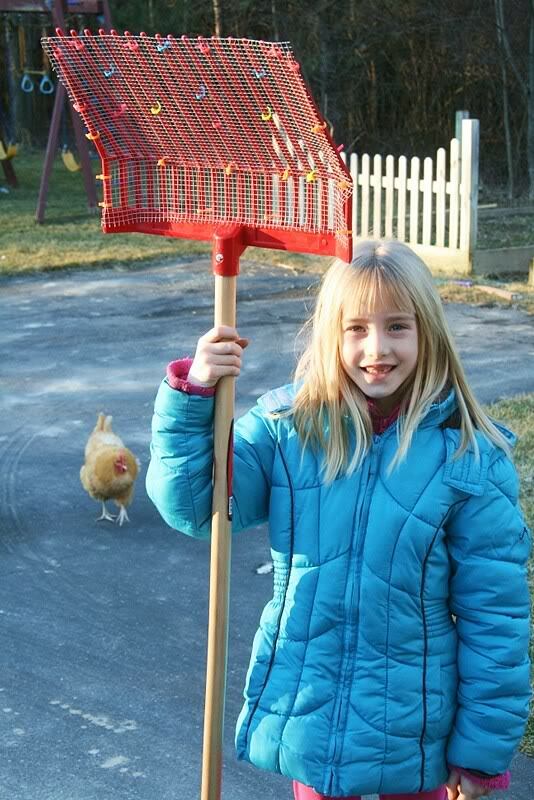 I'm so glad that your daughter convinced you and your husband to get chickens. I can honestly say that I can't imagine ever NOT keeping chickens now that we have them. They are so much fun. Enjoy your new babies, free range them whenever possible, and before you know it, you'll be saying "my pets feed me breakfast!" I hope you continue to visit us! We love sharing our adventures.♥ So I have to ask. Did I convinced you?? If he's not convinced, let me know, and I'll give you my phone number and he can ask me any questions he might have. I'll be happy to answer any concerns that he might pose. Thanks! He's convinced! We had 1 1/2 yds of mason sand delivered today. Hope we picked an ok type of sand. We have already loaded up the chicken run and have given the girls a tour of their new sand. Pearl, our littlest one, even treated herself to a dust bath. I'd have to say that the sand was a hit. Now we have to finish up the interior of the coop and put the sand in there. Did you put any sort of liner under the sand in the coop to protect the wood? Yes I do have a liner. I have a scrap piece of linoleum on the floor of our coop. It works great. I'm not personally familiar with mason sand, but I'm sure it will be just fine. You'll be glad for the sand choice. Now you just need to make a stall rake poop scoop! I bought my stall rake at Tractor supply as well as the 1/4 inch hardware cloth. Easy peasy! Hey! I'm just starting out and have had my 2 pullets and 2 babies for a week now. Still changing my set up around as needed. I have a 4x4 run right now on my grassy lawn. Is it better to leave it or put sand down? I feel like poop will just collect in the grass.....what do you think? First off, Congratulations on your new chickens!! The grass that you currently have in your run will be quickly eaten by your pullets. They love grass (and anything green!). If it were me, I'd wait until they've had the opportunity to eat that grass, and then by all means, fill it with sand! I don't know how big your coop is, but there is a rule of thumb to follow when building a coop and run. 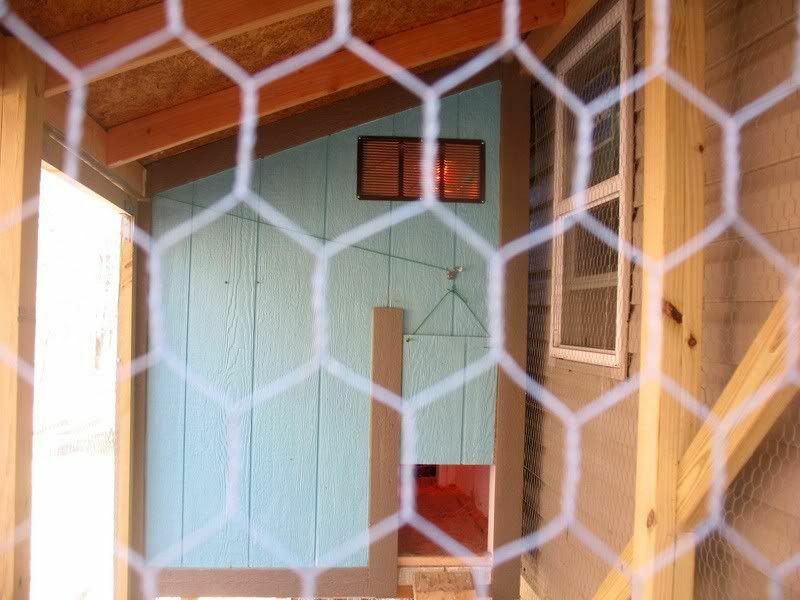 You need 4 sq feet per bird for the inside of your coop, and 10 sq. feet per bird for your run. If you don't follow these guidelines, your chickens will become stressed which will compromise their immune systems, they will be susceptible to illness, become aggressive toward one another, and also their egg laying will be affected. Many of the pre fab coops will indicate that you can house way more chickens than is actually healthy. Hopefully you have the ability to increase the size of your run. Enjoy your babies, chicken keeping is a wonderful adventure!! I do have plans. My husband has been in the process of drawing them up. I'll email what I have so far to you. If it were me, I would remove the rocks and the weed barrier and replace them with sand. 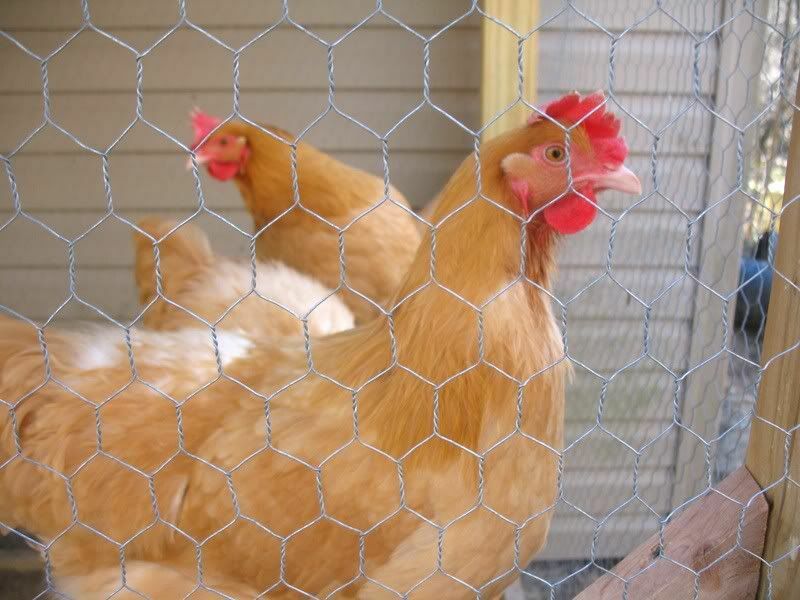 It will be much softer for the chickens than rocks would and easier to keep clean and odor free. Oh Sharon...that is just awful!! I'm so sorry for the loss of your girls! Thank you for your input. So far, I haven't had a problem with mites of any sort (including chiggers). I think it may be because using sand in the coop is a death trap for them. I will definitely be diligent in keeping an eye on their nest boxes. I store the straw in our shed which may be good in keeping the straw mite free. Thanks again for the VERY important heads up!!! The rest of the hens are doing better. I'm so glad that it is over and have no more losses! We live in the 'woods' and have a TON of chiggars - just something we 'deal with'... but didn't have chickens. Now, we have chickens and I see this post that chiggars killed 4 chickens? How would they do this? B/c we have them in our woods - how can I prevent them from getting into my coop? I took your advice and used coarse construction sand for bedding in my 4x6 ft. coop for six Guinea keets. The birds seem to like it, but a large amount of dust is generated every time they or I stir things up. This concerns me due to the silica content of the dust and potential adverse respiratory effects. I've seen at least one reference to silica-free sand, but does this even exist? If so, where can it be obtained? Thanks to you and your blog my husband and I put construction sand into our chicken coop 'courtyard' and up inside the coop itself. We will put pine shavings into the nesting boxes when the hens are ready to use them. We love the sand! It is truly a clean and efficient way to go. We used pine shavings while the chicks were housed inside, in our guest room no less, and I cleaned their environment out up to three times/day. It was so wonderful to move them outside into the coop with the sand. We live in Montana and plan to put clear plastic around part of the coop in the winter to keep the snow and rain out. Right now we use an old sun shade from a former porch to protect the sand. We simply unroll it as needed and then roll it back up, like a blind. Hi kelly, hubby just finishing off walk in coop but undecided what to use for the floor. Was thinking of aubiose as my sand is wet, weather cats and dog's here. Will the wet sand dry out when in there? Just unsure whats best. What do you suggest? Do you think that a combo of DG and play sand could work? I wouldn't recommend play sand. Although it wouldn't be "awful", one of the important benefits of construction sand is that that it's made of different sized, jagged rocks which is not only great for chickens feet, but also detrimental to mites and ticks. I'm not sure what DG is? DG is decomposed granite. No one here seems to carry "washed construction sand." That is why I was considering mixing play sand with DG. DG may not be washed, not sure. I took a picture of the DG here but can't upload it to your blog, but would love to send it to you if you provide an e-mail. Hi Kelly, I give my hens the grass clippings and whatever leaves I mow up. How does this work out with the sand? I would think it would all mix together and eventually become dirty. I'd love to try the sand, my ground is sand anyway, but hard dirt packed. Water just sinks right in which is great. Just LOVE your apple picker adaption! I have many questions regarding your use of sand, so please bear with me and I hope you can answer them. I have cats and I can't just keep scooping out their poop and pee clumps without ever changing the litter because it eventually stinks to high heaven, so how does sand, which doesn't have odor eaters like kitty litter does, completely escape this necessity? There are some people here in So.California who have said that once their sand got wet, it stank to high heaven and they had to get rid of it via garbage pick up. Where do you put all that sand once it has reached it's stink threshold? You can't put construction sand in compost, or in your soil to lighten it up since sand won't decompose due to the silica content in it, and can actually ruin your soil. There are many different types of sand and I hardly think that construction sand is the best sand to use due to the amount of silica in it, after all, construction sand is meant to go into concrete. Just because something is cheap and easy for you, does that mean it is the best for the birds? I mean how many people thought that the kitchen sponge was so easy and sanitary to use only come to find out it is the best environment to grow all kinds of nasty bacteria? Just because you can't see poop particles, does that mean that they aren't there? How can you say with confidence that your run is "sanitary" when studies have shown that sand harbors E-coli? I anxiously await your reply. We just got ducklings and chicks..... we had ducks before and used deep pine shavings.... when small and had water in duck house we would just stir it every day but would still have to change it weekly.... right now in the bigger and better coop we are still working on we have them to one side and using pine shavings then divided part for water mess with sweet pdz....working like a charm.... my question is... once coop work is complete I'm thinking about doing all sand....as this i think would be great for cleaning but not sure if the ducks would like it.... any suggestions? My sister has ducks, and I have chickens. I can tell you that sand and chickens don't mix well; I havent heard of sea or lake chickens in the wild. I'm not sure about ducks, but I honestly don't know of any wild ducks that are around sand. Most marshes or wet lands are muddy, or peaty right? Anything animals poop on will harbor e-coli, so even if it "looks" clean, it will still smell bad after a while and you'll need to be changed out. What are you going to do with all the stinky e-coli infested sand? You can't put all of it in your soil(only 50% by volume), or you'll end up with concrete. 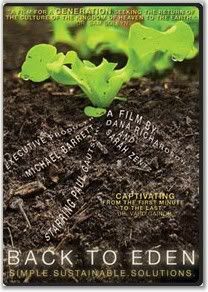 You can't put it in your compost pile, it won't completely decompose into soil minerals either. Sand people say to change out the sand every six months, depending on how much sand you need, that may be a big stinky problem. Please think this through from start to finish before you opt for sand. I am about to become a first time chicken owner. Coop is in progress and chicks should be hatching later this week. I read your info about sand and was super excited to try it as it sounds by far the cleanest method, however, the place where I am buying the chicks has me a little scared. They said it is great for the run but suggested not using it in the coop. They said with any humidity some sort of bacteria can form in the sand that can be very dangerous to the chickens. Do you know what they are talking about? How can I prevent this? 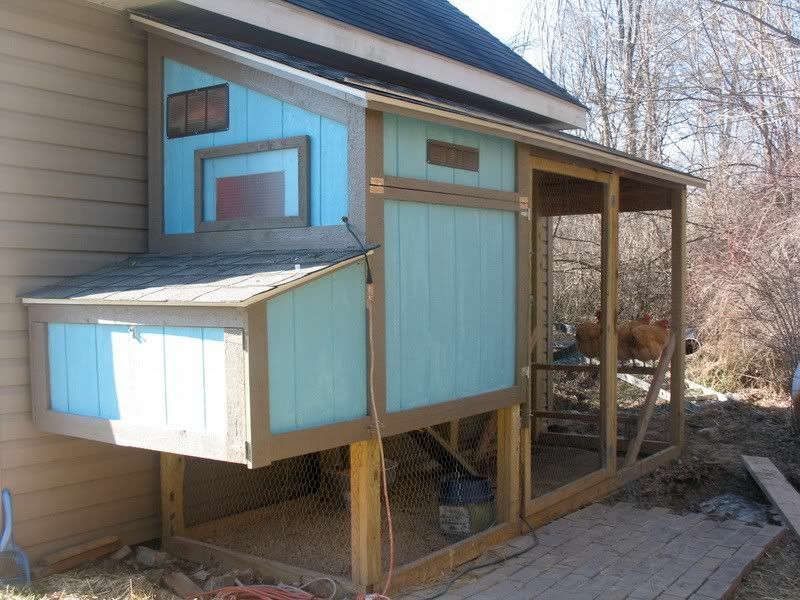 I will have a small 3x5 barn dhsped coop for 4 chickens.